Prow eagle needs some more attention. Ofcourse, a copy of an existing scheme. Sheep was okay with it. Oh, I also did the drop test. Not with an iPhone, Samsung Note or Motorola X but with above model. Drop height about 150cm. Result: no damage, no paint chip. Conclusion: good glue, well crafted resin. Resin Addict got a stamp of approved. Wow, looking really good! I should really send you some test prints once I've got them! Thanks. 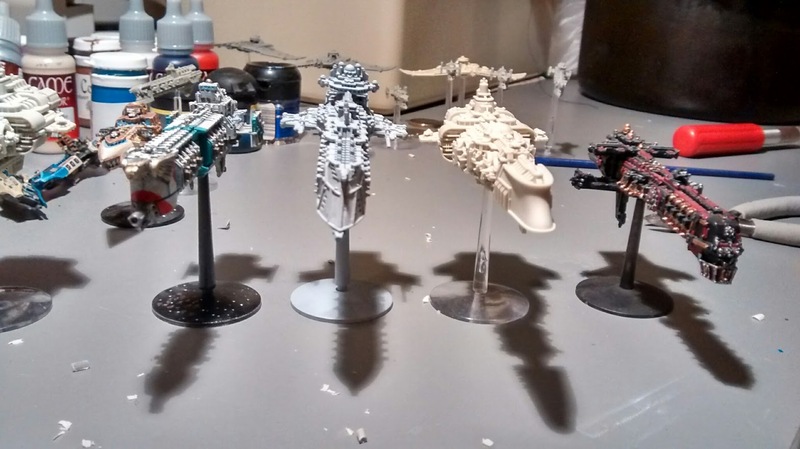 Would happily paint some test models for you. Great work, Horizon! It turned out great, but I do have one comment: I think the prow overall is too bright. It does not feel as weathered as the rest of the ship. Perhaps applying some dark washes in a kind of "filter" style would tone it down appropriately? yeah, the red is rather bright in those pictures, in real life it is a little less bright. But since I still need to improve the gold (especially shading) I can take a look into it. I can see the inspiration from Seb's models indeed. For gold I hit on a happy accident when I was painting that Reaver last year. Start out with a mix of black and Balor brown (or similar color) for the undercoat. This should be a fairly dark green-brown-gray. Then do a layer over it avoiding the crevases with balor brown and a touch of gold. For the next layer just use straight gold and for the highlights mix a bright silver like Mithrial in to it and hit edges sparingly. It gives a really nice weathered gold. Vaaish wrote: For gold I hit on a happy accident when I was painting that Reaver last year. Start out with a mix of black and Balor brown (or similar color) for the undercoat. This should be a fairly dark green-brown-gray. Then do a layer over it avoiding the crevases with balor brown and a touch of gold. For the next layer just use straight gold and for the highlights mix a bright silver like Mithrial in to it and hit edges sparingly. Hmm, interesting. On reading it seems a pretty dark result. The pics tell otherwise. Cool. Thanks. Yeah. Blindhorizon vessels are done, pictures to be made. I think they ended up pretty neat. And I managed to get my hands on an Eldar shadow plus two Hellebores. 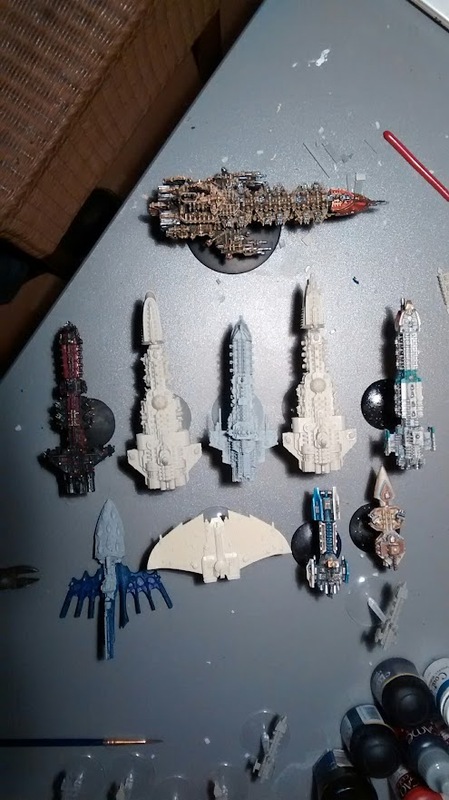 With that I completed the CE fleet. Low l.t.r. 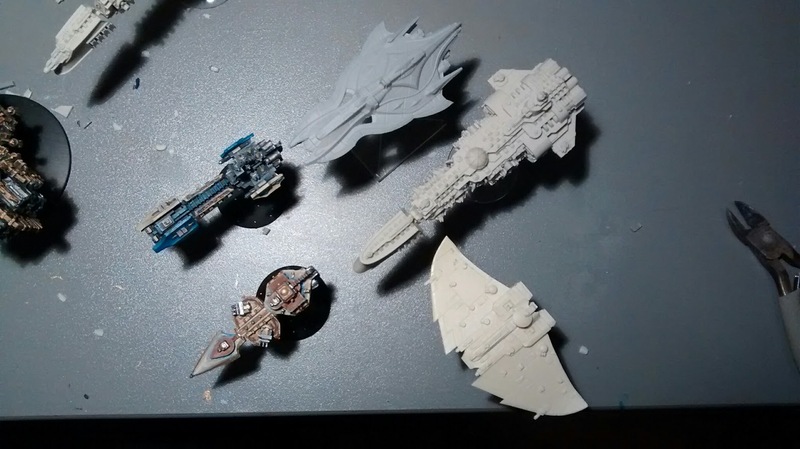 : GW Eldar Shadow Cruiser, FW Tau Protector, FW Space Marine Strike Cruiser, BlindHorizon's Light Cruiser. Good flight into 2015 all of you! Your new additions look very comfortable. Well worth it. Yay 2015! can't wait to get my hover car and house robot lol. 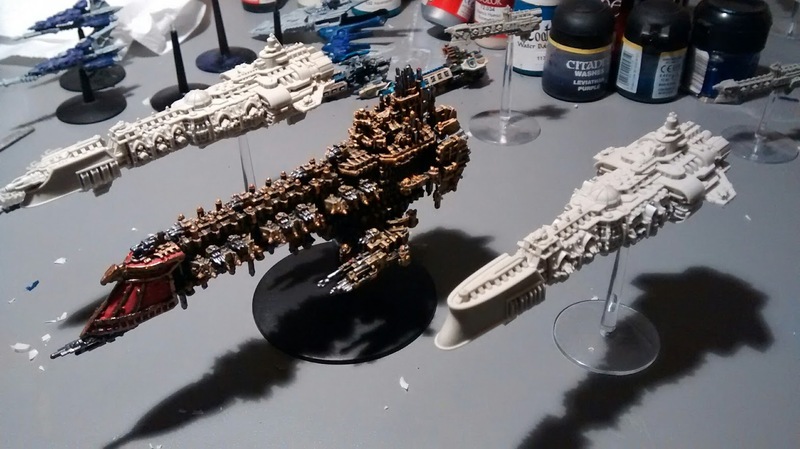 Man, if those cruisers are almost the size of a battleship, I'm really curious to see how a Battlegroup Helios battleship will be like! 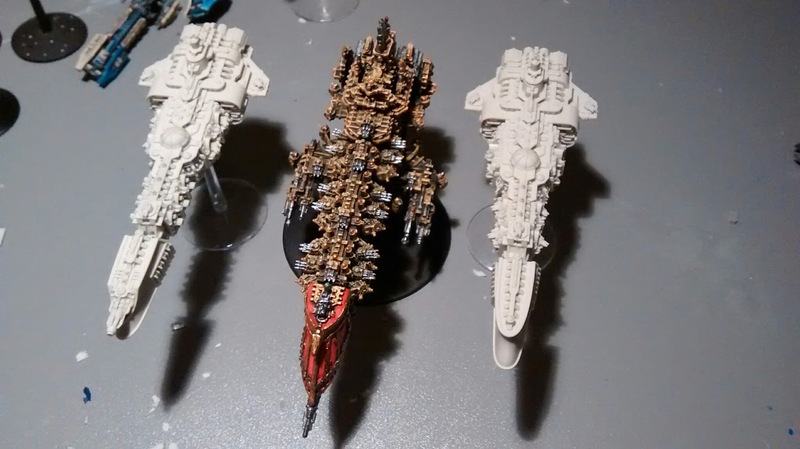 Malika wrote: Man, if those cruisers are almost the size of a battleship, I'm really curious to see how a Battlegroup Helios battleship will be like! I'm thinking they'll be like I like 'em, big, beefy, and a worrying presence on the field. Beefy? 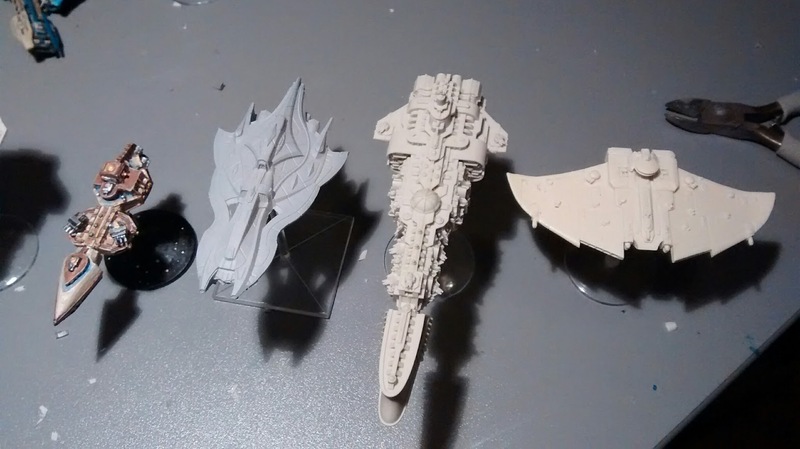 Hmm, interesting, since the cruisers seem to be a bit longer and sleeker than the BFG models. However, something for supersized like this, this, or that would be pretty sweet. Basically a 'dreadnought'! They're sleek and elegant true, but they're still the size of battleships, a size hidden behind the elegance of the lines and the balance of the hull. A battleship will likely maintain that elegance and balance, but it'll be larger still. 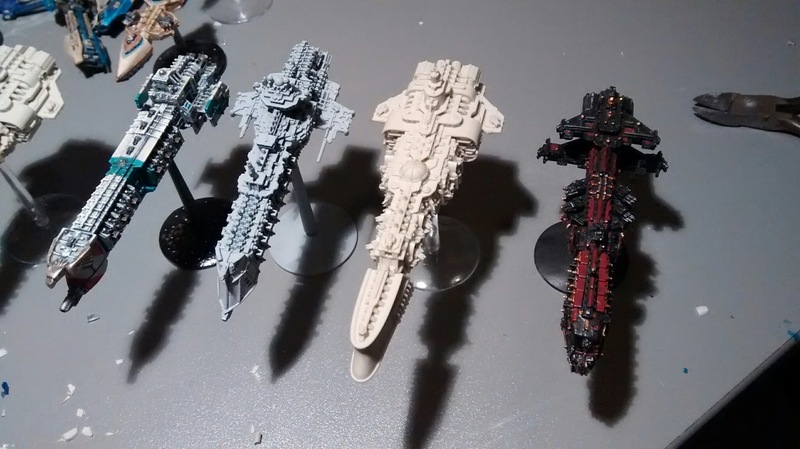 If these are "capital ships", then a battleship will truly be a sight to behold! I'll have to take some shots when I get home myself. I'm a bit surprised at how large the Helian ships look in the shots. Including the prow ram on the GW cruisers, the Helian ships are a little under a cm longer which shouldn't put them into battleship range. We do want the capital ships to exude more weight though so expect the BB to be beefy.